By Mackenzie Almeida from Maddie Day's Cozy Capers Book Group Mysteries. 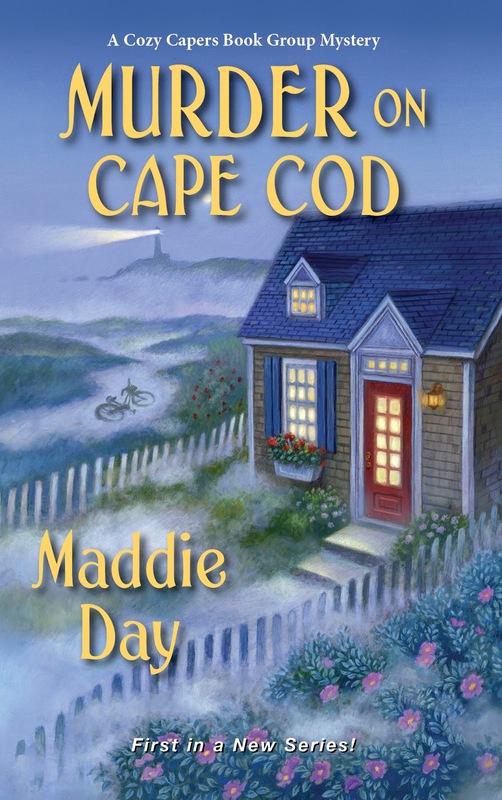 Murder on Cape Cod releases next month! Maddie has one last ARC to give away, too. Hey everybody, this is Mac. It's November and getting cold here on Cape Cod. The tourists are gone and my bike shop is serving mostly only locals until next spring. When a damp wind is whipping along the bike path, visitors don't tend to rush in and ask to rent bikes for a family of five for a week. I still have business from my dedicated regulars, but I don't mind a more relaxed schedule for the off season. So I'm hanging out in my tiny house behind the shop more than usual. Somebody's happy with the plan: my African gray parrot, Belle. I'm wicked allergic to cats and dogs, so she's the only pet I can have. We have fun chatting and she's super smart. Right, Belle? "Belle's a good girl. Gimme a kiss, Mac." You can't help but laugh, and laughing is great during the dark days of late fall. I throw her a kiss. "Snacks, Mac? Belle's a good girl. Belle likes snacks." I bring her a chunk of frozen carrot. I switch on my wireless speaker and bring up Pharell Williams' "Happy" on my phone. You haven't lived until you've seen a parrot dancing to that song. Makes me laugh every time. I hope you've had a chance to pre-order your paperback of Murder on Cape Cod from Barnes & Noble. My author says it'll be out on all platforms in all formats a year from December, but for now, B&N is your exclusive source. Readers: What experience with birds have you had, domesticated or wild? Maddie will send her last ARC of the new book to a commenter here today. Maxwell is President of Sisters in Crime New England. She lives north of Boston with her beau and two cats, and blogs here and with the other Wicked Cozy Authors. You can find her on Facebook, twitter, Pinterest, and at her web site, edithmaxwell.com. I adopted a parrotlet and at 7 am and pm he went bananas! Squawking, whistling, making crazy bird sounds! No clue what always happened at 7 in his former home. Our friends have an African Gray. He is fun to talk to. My friend has one, too. She collects phrases for me! We had parakeets for pets when I was a kid. Now we love feeding the wild birds and love to relax on the front porch and watch them. We see everything from hummingbirds to eagles. Was blessed to have already read this wonderful book. HIGHLY recommend it! I've never had a bird :( But I do love feeding the outdoor birds. We had a woodpecker that would knock on the door if the feeders were empty. young kids they wanted birds. We had parakeets for quite some time and we had a few that got egg bound and it was really upsetting to our daughter so we stopped replacing them when they passed away. I did enjoy their chirping and singing sounds for the years we had them and I know our daughter really was happy we let her experience owning and caring for birds....then fish. And cats and a dog and then kittens that had been found. We had quite an assortment and happy to have experienced all of them with our children. My ex had a pair of love birds, they were cute. I wouldn't let him have any birds when we were married because of the cat. I'm a cat person and only a cat person. I can look at them outside or in other places and appreciate them and their beauty but I don't like seeing birds caged up. Thank you so much for a chance for your last copy. I am a huge fan of Cape Cod and know I would enjoy your book. I have ecperiences with birds other than watching bird shows at zoos & etc. My son was horribly afraid of birds when he was young. I hope he got over that! My most amazing experience with birds was when we lived in Australia. My backyard was filled with cockatoos and other beautiful parrots. We named one Joe Cocker. He would come up to the sliding glass door and knock with his beak to let me know that he would like some seed please. I love all animals including birds. This sounds like an exciting book and I would love to read it. I had a parakeet named Bacchus who sang along to classical music. I also seem to attract parrots, who like to land on me. Once at the Evanston Zoo, a little side trip on a work relocation, a macaw landed on my shoulder. A keeper appeared and yelled, "What are you doing?" "Just standing here, not doing anything." "He's not supposed to be out here." "Tell him. He's not hurting anything, though. He just seems to like me." I stood still, he retrieved his bird. Only the keeper seemed upset. The bird and I were "chill." First a question--"My author says it'll be out on all platforms in all formats a year from December," ??? A year from December? Perhaps this year in December? As to birds, our niece has an African Grey parrot. They are wicked smart! He fools her dogs by calling them by name and asking if they want to go out. Gets them really wound up! More amazingly, there were three dogs and one died. The next morning the bird greeted the remaining dogs as they came downstairs, as per usual. But one dog was missing. He started calling, by name, for the missing dog, going through all of it's nicknames! That is correct, Libby - except the author should have clarified: "all OTHER platforms and formats." This year's release is only paperback only from Barnes & Noble. It's an exclusive between Kensington and B&N and is quite frankly an experiment. None of us is quite sure how it will fly! My daughter got a cockatiel for her 10th birthday. She taught him different words and she would play uno with him. When I got my sun conure, Mango, the two birds would "talk" together. I enjoyed those birds. I don't have any experience with birds, except for feeding the outside birds. I think parrots are beautiful birds and I would really like to see them in the wild. Belle sounds like an amazing pet,looking forward to reading more about her. When I was younger I attempted to birdsit my cousin's Parakeets. My brother had the lovely idea of use picking up the birds from my grandparents on his bicycle. Meaning we were bought on the seat and the birdcage was on the handlebars. I'm guessing you might have an idea of where this story is going. He hit a bump, I lost my grip on the cage and the birds flew away. Oh no! I hope they survived. I haven't had any personal experience w/ owning a bird, but a friend owned a ton of them and they were fun to visit. I also love watching birds year-round from our sunroom. I love watching birds from inside, too. I used to work with Florida Scrub Jays. We had a permit allowing us to feed them in order to get them close enough to record leg band colors, count juveniles, map territories, etc. My office was in the field, near a couple of overlapping Jay territories. In spring and fall, I'd leave my door open for fresh air. It didn't take them long to figure out there were peanuts in my office. They would squawk from the roof, land on the door and look at me, even fly into my office and sit on my desk or cabinets in search of peanuts. Love watching the birds that visit the feeders in my backyard. I had a blue parakeet through my elementry years. Rhubarb would fly to me and land on my shoulder. Loved that bird so much! Eileen, you are our lucky winner! Please email your snail mail address to me at edith at edithmaxwell dot com. Growing up in a Chicago apartment, cats and dogs weren’t even an option back in the day...at least not for me. A parakeet was my first pet. He was allowed to fly around the apartment where he pecked at mirrors and chatted to himself. He may have damaged some lampshades...Unfortunately, he flew off my shoulder and out the door one day...never to return...sad day for a youngster...but maybe a good day for the lampshades? Eileen AW is our lucky winner! Thanks to everyone for entering. Eileen, please email your snail mail address to me at edith at edithmaxwell dot com. A friend of mine has an African Grey. He's quite the talker. I've always been raised with birds in our household. We had parakeets and canaries when I was young. My mother adopted 2 cockatiels named Betty and Jack. They used to drive my father nuts because they whistled whenever he was around. Our family then adopted a double yellow headed Amazon parrot who had a previous owner named George which was also my brother's name. Needless to say it would yell for George among many other thinks. Birds can be great company all depending how much time the owner wants to put into their care.